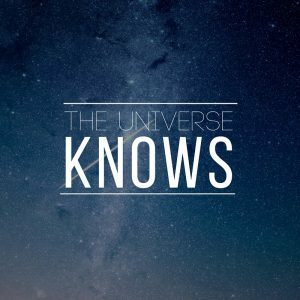 Have you ever had this happen: You need something in your life, only you don’t know it yet, so The Universe keeps presenting it to you over and over again, until you finally catch on? That’s how it was for me with this book. I was incredibly skeptical of “a secret to love that lasts,” and had ignored several recommendations. A close friend finally convinced me to read it because she truly believed this book would help me get through a trying time. “It’s up front with the best sellers,” directed the sullen clerk at Barnes & Noble, with a non-verbal Duh. “Everybody has read this book,” he added, making it quite clear to me that I was behind the times. That clerk was right, I definitely wish I had read this book sooner! 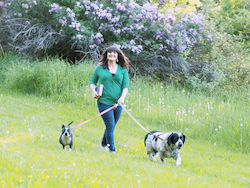 It clicked with me immediately and I felt a surge of relief when I was finished. I knew right away what I had learned would change my life. The presentation is cheesy at times, but the information is solid and easy to understand. I appreciate any method of teaching that acknowledges how different we all are from each other. 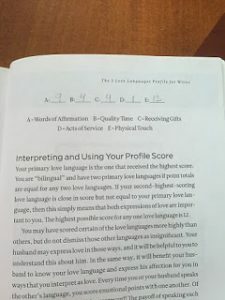 My husband (then boyfriend) read it at my request and we compared our results to the Love Languages Quiz. 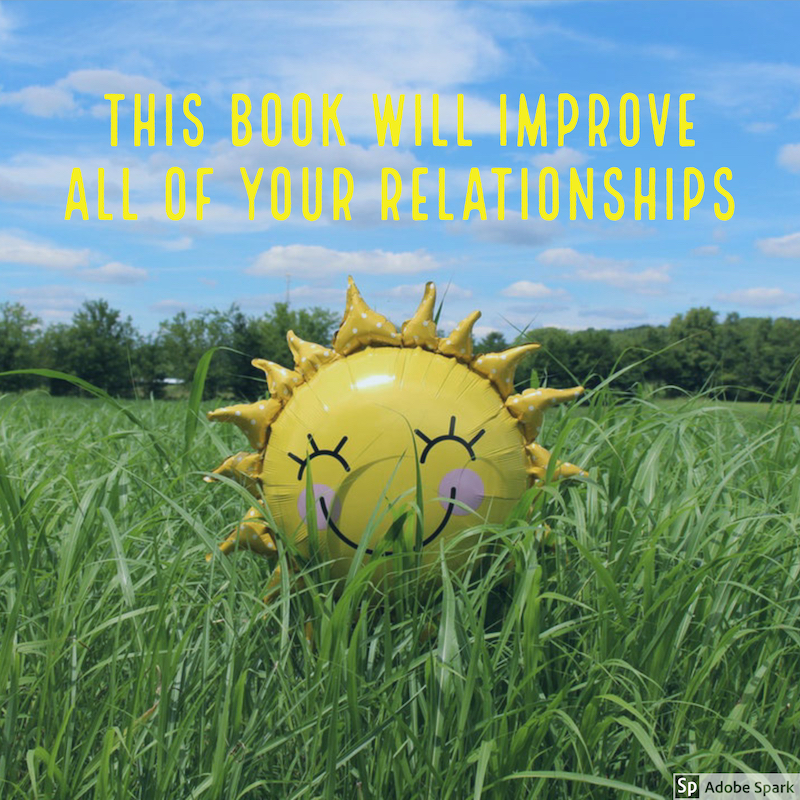 I can’t say this automatically solved all our “issues,” however I can say without a doubt that this book played a crucial role in our process of healing and moving forward. Identifying and discussing our Love Languages certainly taught us to better understand where the other is coming from, and to communicate clearly, in a way the other will understand. Surprisingly, I learned a great deal about myself while reading this book. Learning that my primary Love Language is physical touch, I finally felt I had permission to acknowledge I am a physical person and release the associated shame. It helped me understand it’s okay for me to crave physical affection (romantic and non) and that having a sexual nature isn’t a negative thing, but it’s in the way I handle it that can be unhealthy. The 5 Love Languages focuses on romantic relationships, but I gained a ton of insight that has aided me in navigating relationships in all aspects of my life. Knowing my Love Language is knowing what I respond to best in terms of praise and correction in work relationships. It has given me the confidence to say “This is what I need to thrive…” to co-workers, bosses and friends. It has helped me recognize what others need, and provided tools for times when I need to speak to someone in a language different from my own. My relationship with everyone important to me has changed after reading this book, and that includes my relationship with myself. If you’ve read The 5 Love Languages, do you agree with me? If not, why? If you haven’t read it, you should!! I have actually never read the entire book (though I own it and will at some point) but I’m familiar with the information, and actually used to use handouts on it during couples’ therapy. I think it’s a wonderful tool for people to understand themselves and others, and like you said, improve communication. That’s great to hear. So often romantic relationships, we tend to focus on trying to get our partner to change or change ourselves to please the other person. I appreciate that this focuses on accepting how you and your partner are and working with those characteristics. I know that is a big part of why it helped my relationship. 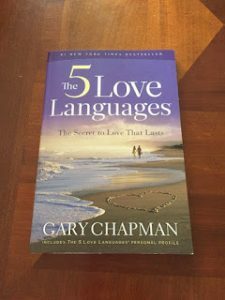 I took the quiz online for this book after hearing many people in a forum I follow talk about how important it is to not only know your love language, but to know your partner’s love language and then find a way to make them work together. I still haven’t read it, but my result was acts of service top ranking with gifts and physical touch landing at low ranking. Both of which I knew but didn’t know how to express. I haven’t had Chris take it yet, but I can tell you the spoken one as well as physical touch will rank high for him. Just taking the quiz I can pin point that much. I need to read this book so I can do more than just know where I am on the scale, the quiz was great but I need to take it to the next step.